It is essential to view the pictures of this blog at full size; by clicking on the relevant picture it will be sufficiently enlarged. 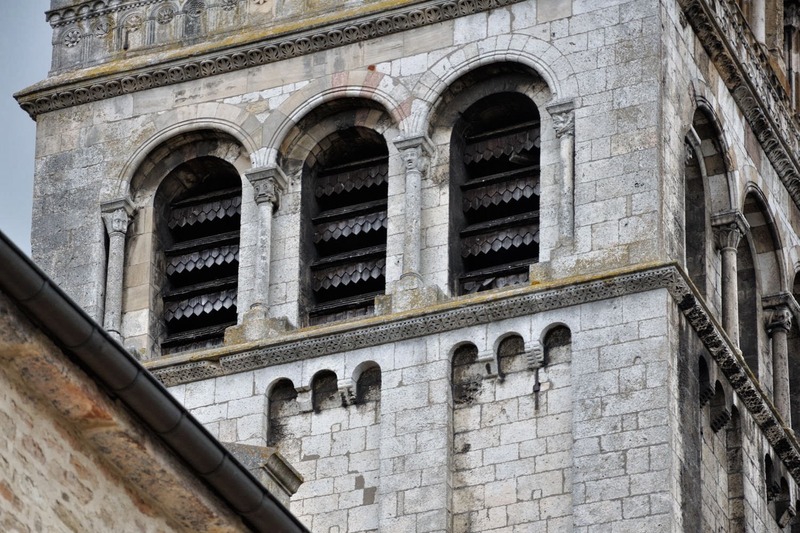 Picture 1 shows a number of relatively simple decorations, applied to the facade of the abbey church of Tournus. 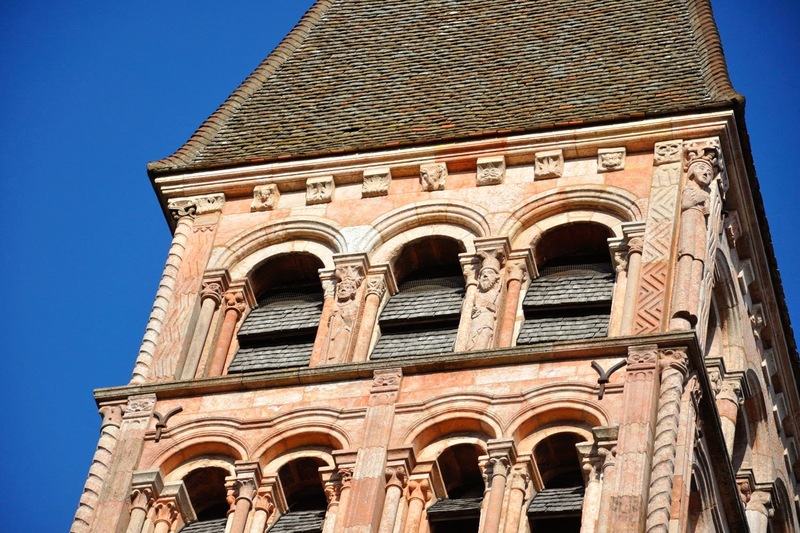 The Lombard bands, supported from lisenes are clearly visible; the facade also has two more friezes. The upper one shows a flat saw teeth motif in the plane of the wall; the lower one has a protruding saw teeth motif with the teeth protruding perpendicularly to the wall. In a book about Romanesque art I once read a good piece of advice: when you go visit a church, it is a good idea to bring a torch and a pair of binoculars. This may sound a bit strange, but crypts can be rather dark, and a torch can help you to see an interesting capital. The same goes for capitals high in the nave of a church. A pair of binoculars could make those capitals visible. How to go about high capitals in a dark church is something the author did not tell. A pair of binoculars however can also be useful for studying tall bell towers. 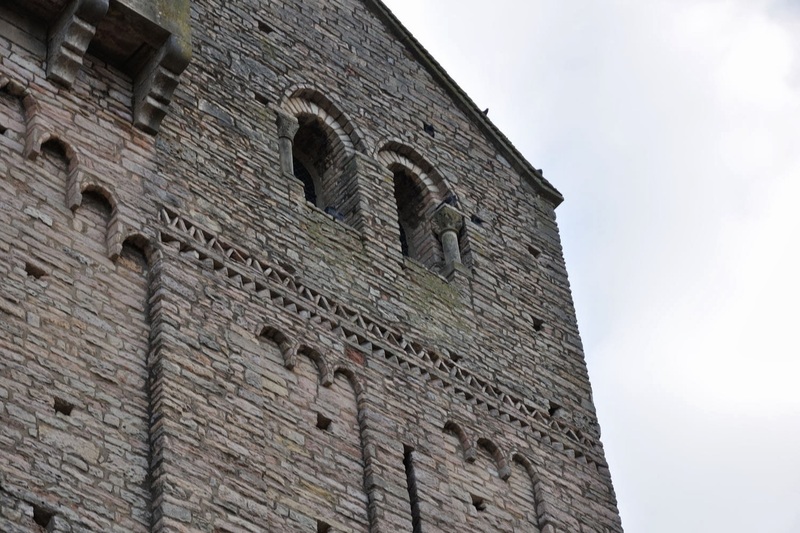 Picture 2 shows a number of finely sculpted columns, three with a helical motif (on the corners) and three in the shape of an human figure (on the top storey, in the middle and on the right hand corner). The modillons are also beautifully carved. The decorations in picture 3 are a bit less exuberant, however not less interesting. Here also very distinct bandes lombardes, but exceptionally interesting are the sculpted capitals in the shape of distorted faces. For these sort of pictures a zoom lens is worth every penny. I am quite content with the results I obtain with my 18 - 105 mm zoom lens. 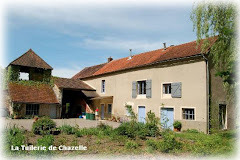 Tournus is only 25 minutes driving away from La Tuilerie de Chazelle. In the area we live in one encounters regularly signs saying "Site Clunisien", which are located at the beginning of a village or, in some cases, fixed to the wall of a building, usually a church. I had always assumed that those were references to interesting Romanesque churches operating under the umbrella of and ruled by Cluny abbey. I am referring to churches like those of Chazelle, Malay, Saint-Gengoux-le-National, Saint-Hippolyte, etc. Analogous to this the church of Chapaize was a subsidiary of Tournus abbey, which would explain why there was no sign like that in Chapaize. This "theory" turned out to be based on sheer ignorance. The first time I assumed that there might be more to the word site clunisien than I thought was during an excursion I made in honour of the introduction of the website "clunypedia.com", a site hosting an interactive map of sites clunisiens in and outside France. Apart from Cluny abbey we visited the Chapelle des Moines in Berzé-la-Ville and the Domaine des Vignes du Maynes, a vineyard in Cruzille. Maynes appeared to be a corruption of the word Moines, so the connection with Cluny did not seem to be totally illogical. The monks from Cluny had been producing wine here, a long time ago. However, I completely failed to see the connection between a vineyard and a church building. Apart from that, the interactive map of sites clunsiens was not exactly densely populated with sites around here, something that surprised me a bit. The man who gave the introduction to Clunypedia emphasized that the whole site was still under construction, which would explain the lack of churches on the map. 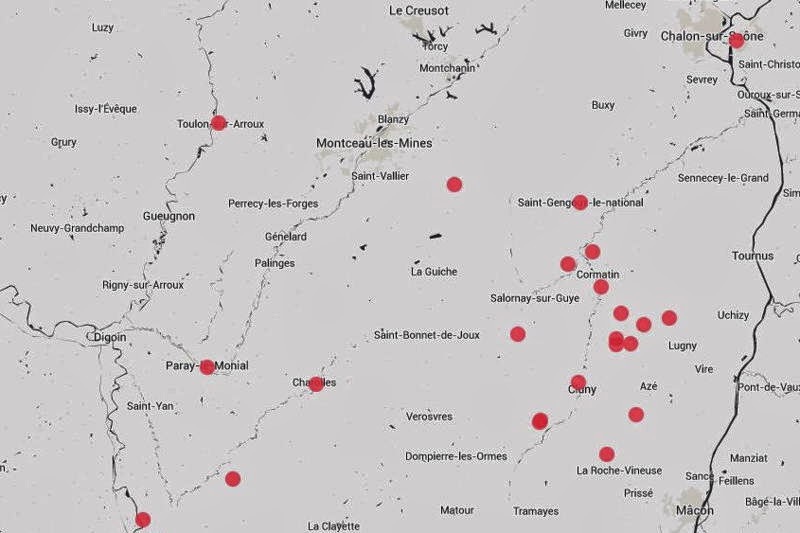 Recently I was browsing on yet another website, "sitesclunisiens.org", and it seemed like a good idea to plot out all the sites clunisiens, at least around Cluny, on a map. I assumed beforehand that this site would show considerably more sites clunisiens than Clunypedia did. However, that turned out to be not true. On the picture the density of sites clunisiens around Cluny is not high at all, at least not when one knows how many Romanesque churches there are around here. The picture below shows how many Romanesque churches there are in roughly the same area. The difference is stunning! A closer look at "sitesclunisiens.org" revealed the following: according to this site there were not more than approx. 110 sites clunsiens in the whole of France. 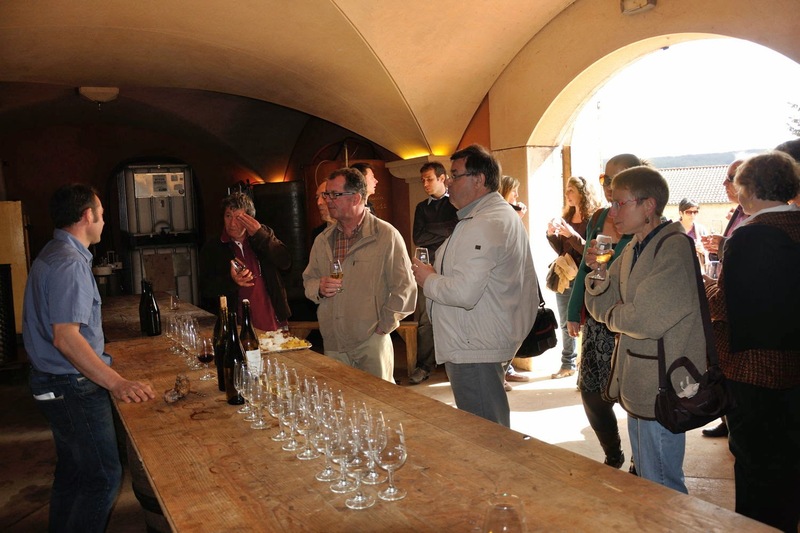 All entries on this site are exclusively prieurés, doyennés or domaines (vineyards). And it was only then that the penny started to drop. A prieuré (priory) is a subsidiary, hence a "daughter" monastery of the "mother" abbey. And that Cluny abbey had quite some daughters was well known to me. A doyenné (deanery) is a supplier of agricultural goods to an abbey or priory, and since monks cannot live on fresh air alone it seemed logical that there were quite a few deaneries near the many monasteries in the area. A doyenné has a different meaning in the hierarchic structure of the Roman Catholic church as well, which will be explained later. 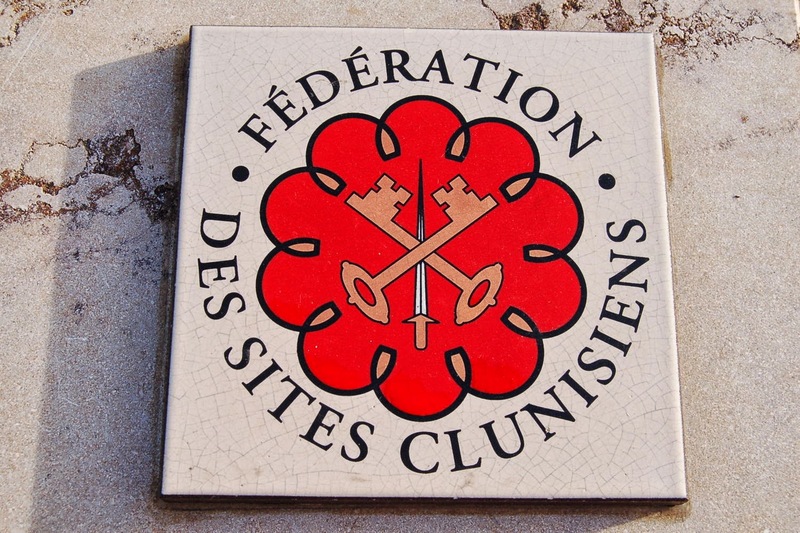 That wine suppliers ranked quite high among the sites clunisiens can be explained by the fact that Cluny is located in Burgundy. Sacramental wine has got to come from somewhere, right? The amount of sites clunisiens was by now more or less equal and identical on both websites concerning this subject. But whatever happened to all the other churches around Cluny, such as Jalogny, Ameugny, Ougy, just to name a few? Were they excommunicated because they had been disobedient, and kicked out on the harsh streets of the Clunisois? Or had they decided to gang up with other abbeys, such as Tournus or La Ferté? It was then that the penny really dropped. An abbey or monastery is simply not in charge of parishes or parish churches! 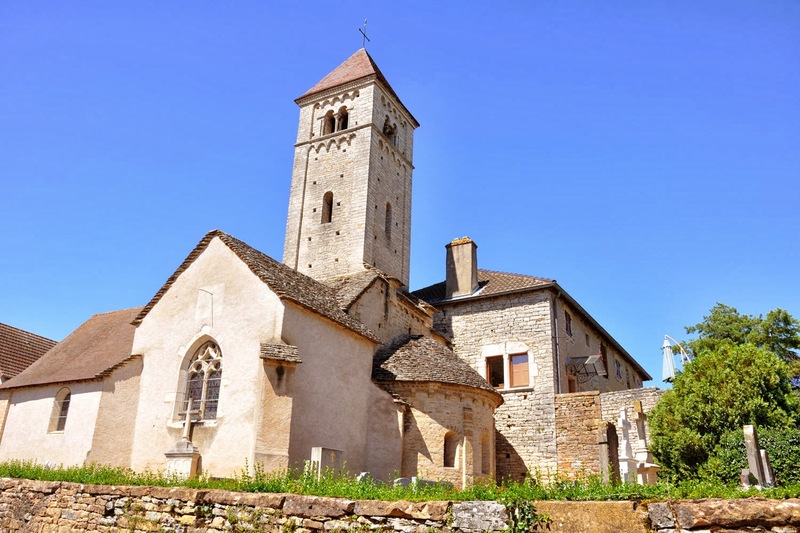 Parish churches fall under the jurisdiction of a doyenné (to increase the confusion, a doyenné in French is also the administrative layer between the individual parishes and the diocese), and the deans running those deaneries are reporting to a bishop, not to an abbot or prior! And of course, most or all of these sites clunisiens have a church; the reason is simply that every priory or abbey has a priory or abbey church. And that is very often the only remaining part of the priory or abbey. Who would however ever have thought that an interest in Romanesque churches would lead to thinking about the organisation charts of the Roman Catholic church? Despite the story above, around La Tuilerie de Chazelle there are more than sufficient sites clunisiens to keep those interested busy for a day!